Project management platforms aim to help companies manage workflow in an efficient and effective manner. They offer a return on investment because they avoid confusions that can come from poor communication and save money by reducing the amount of meeting time. When comparing Trello to Basecamp, it is important to consider what you would be hoping to get from your platform. Let’s look at these points one by one and see which, between Trello and Basecamp, comes out on top. Task allocation in Basecamp is done through a to-do list. This is the simplest way of organising work and has succeeded for most for centuries. It is likely that the odd Roman road-maker scratched out a list of tasks on a piece of stone that needed to be ticked off before the road was complete. The to-do list in Basecamp is a little more sophisticated than a simple typed up list shared amongst a team. There is the option to allocate team members responsible and to set a deadline for expected completion. Those responsible will be informed that they have been allocated the task and when they will need to get it done. It will also show up in the assignees schedule, a calendar within the platform that represents each team members’ workload. Trello organises workflow in a Kanban chart. It is a great way of visualising the whole project from start to finish. 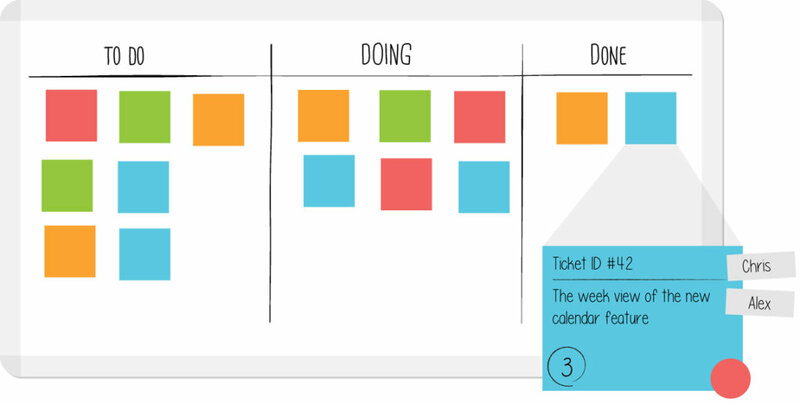 Each list is used to represent a task, each task together building to be the whole project. Within each list, cards can be created, which are the items that need to be done and can be dragged along the workflow of lists. For instance, if you are publishing a book you would have planning and developing, writing, editing, proofreading, graphic design, formatting and then publishing. Each of these steps would be a list and the card would represent the book being completed. You can allocate tasks to people by mentioning them in the card. The assignee can then receive all the information needed to complete the task by documents attached to the card. There is also the option of creating checklists to make sure all subtasks are complete. If you are looking for an excellent representation of the whole project workflow, then Trello works well. The stages of the task are clear and it is easy to see what progress is being made – thanks to the simple drag and drop system. However, Trello is built around the project and not around the team. On the contrary, Basecamp, with its individual camps for different teams, organises the to-do lists in the relevant teams. The notifications sent from Basecamp are more reliable and the sense of accountability to the completion of a set task is easier to ascertain. For clarity and efficiency in task allocation, Basecamp is the better platform with its simple to-do lists and schedule for the individual to see what needs to be done. There is the message board, where ideas can be developed and organised into threads. Then, there is Campfire, a chat app that allows people to share instant messages. This is available as a standalone application for your phone, tablet or desktop, as well as integrated within the platform. Communication is one of the major strengths of Basecamp. It is strengthened by the automatic check-ins. This is when a manager can ask questions that get sent automatically to team members over a set period. The answers to questions, such as: “how is the project going?”, are then summarised on a single page giving the manager an instant update on progress without having to call a meeting or request an update with an email. Trello, on the other hand, does not have a chat option within the software itself. There is the option to @Mention a specific team member and to comment in each card. This does have the benefit of organising comments into specific items and therefore making it easier to find information. However, Trello does integrate with Slack, a communication app that is free for a small number of users. Slack has many of the same features as Campfire, organising instant messages under threads and allowing file share. Trello also integrates with Google Docs and Google Drive, giving the option for the organisation of information. Communication is an area that Basecamp identified as a pain point and sought to solve. They recognised that email inboxes got overwhelmed and lengthy threads were confusing and inefficient. Therefore, the message board and the instant chat app are its stand out features. 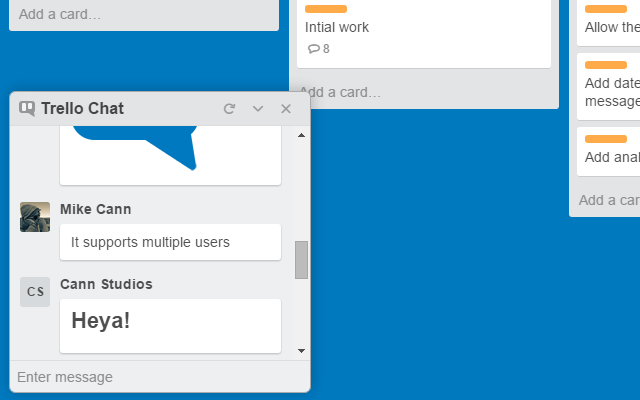 Trello seeks to counter the lack of chat app with an integration with Slack and Slack is an excellent chat tool – and does rival Campfire in its functionality. Therefore, Basecamp only exceeds Trello’s offering in the convenience of features being held in a single application. Trello is accessible anywhere as it is opened in a web browser. Therefore, anywhere at any time your team can view the state of the project and find out what is needed and by when. The state of the project is transparent to all who can see the board, which is managed through permissions. There is the integration with Google Drive, which is how file sharing is possible. You can also attach files to different lists and therefore files are always relevant to the task or subtask it is attached to. Basecamp is also available in the cloud but doesn’t offer the same visualisation of the workflow as Trello does. It does include an online file and document storage area. This is useful as each storage area is within a team, therefore there is an automatic organisation of the documents. This makes it easy to find the information that you might need to complete the tasks. The ease of collaboration comes from the transparency of information, such as the schedule – which is a calendar that is open for all to see that shows all the tasks and deadlines that are coming up. There is even a chance to discuss events on the schedule page – making it easy to follow up on issues. Trello comes out strong here, as the ability to see the whole of the project makes collaboration and sharing easy. 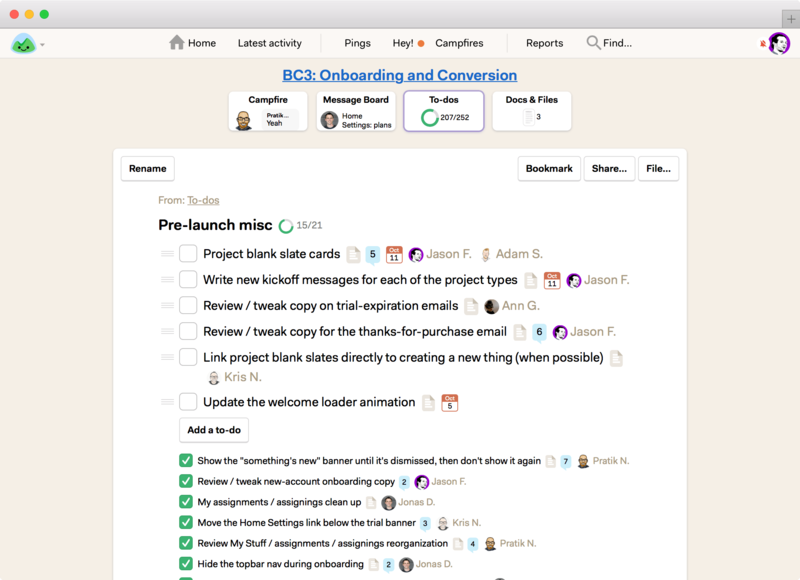 However, the communication tools and schedule feature in Basecamp make collaboration at the heart of this platform and a strong reason for opting for it over Trello. If you want more app integration and security then there is a business class subscription of $9.99 per user. You can upload larger files and organise a view of all the team boards in a Collections screen. The enterprise level subscription of around $20 per user offers much greater security, including 2-factor authentication. You also receive personalised support in executing the platform. In reality, most of the features of the software are free. Basecamp is free for teachers and students and comes at a 10% discount for non-profit making organisations. 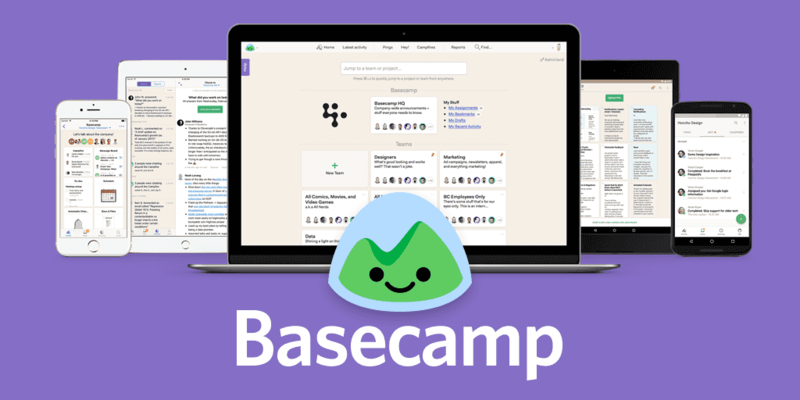 For everyone else, Basecamp costs a flat fee of $99 a month. There are no per-user fees – for this price you get unlimited users and unlimited projects. Considering much of Trello is free, it is hard to debate which platform wins out here. However, Basecamp is reasonably priced for unlimited users and unlimited projects with access to all features. It is arguably a lot of platform for the price and you have to judge these things in terms of return on investment and Basecamp gives you a lot for your money. Overall: Which Is The Best? Well, to put it simply, it is a matter of taste. You have to ask yourself: Do you want the visualisation of the whole project for the whole team? Because in this case, Trello is excellent in this regard. It simply and effectively shows the whole project on one dashboard. However, if you like the idea of a simple list and clear allocation of tasks, then Basecamp works incredibly well. The schedule function gives transparency of the whole project to the whole team. Trello wins out in terms of cost – for the most part, free to use. However, Basecamp is an excellent investment in terms of the number of solutions it offers to work organisation. The chat app alone is worth the price – and Campfire can be downloaded separately. If you are looking to making just a single decision, then it is recommended you opt for Basecamp, which has everything you need under one umbrella. Trello can fulfil all that you need but you will need to download third-party apps such as Slack and use other sites such as Google Drive, to equal the functionality of Basecamp. Trello vs Basecamp – who wins? 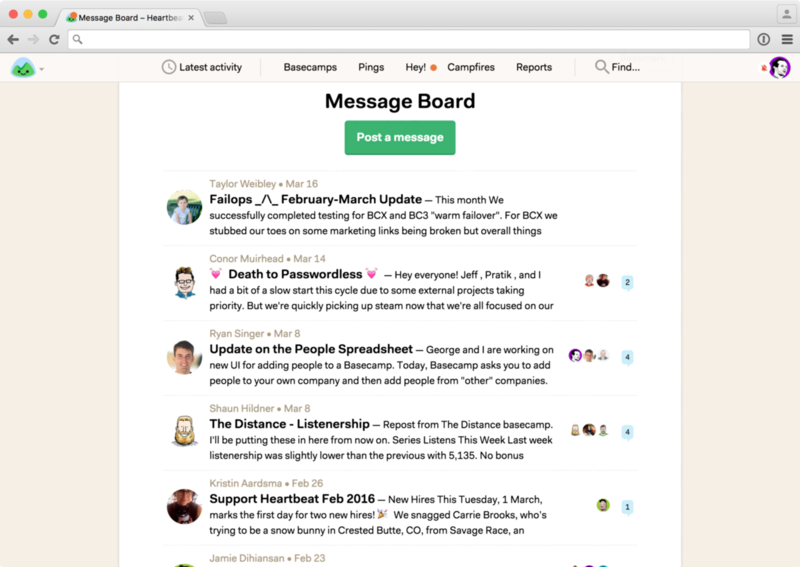 It is a close run thing but realistically Basecamp is a complete package and equally as easy to use as Trello.